World Peace Starts with YOU! The Georgia Meditation Center will be hosting a 2 day retreat with Venerable Nicholas on March 9th and March 10th, 2013! Join us for one day or both! This retreat introduces meditation skills and their application in working constructively with negative emotions including anger, obsession, delusion, stinginess, arrogance, dissatisfaction and blindness to virtue. 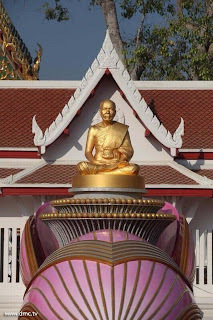 Venerable Nicholas Thanissaro MA, BSc., PGCE is a Buddhist monk of UK origin. 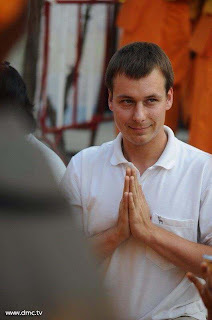 He has been a monk for fourteen years and has over twenty years of meditation experience. He has been giving popular mediation courses in Europe since 1997 and has several TV guest spots, audio CD's, books, book translations and academic articles to his name. Creating Peace for the World starts with YOU! World peace can become a reality only when everyone finds peace within himself or herself, which is inner peace. Each person can experience inner peace when his or her mind is cleared of all thoughts and becomes focused and still at the center of the body. This practice of mediation is the link to world peace. Wisdom obtained from mediation will help one solve problems and guide one through life. The mind will be purified and clarified. All the impurities in one’s mind will vanish. Love and kindness will be in one’s mind. 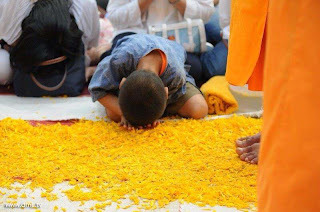 He/she will wish that everyone in the world would meditate, that everyone in the world were purified, and that everyone in the world would know true happiness forever. 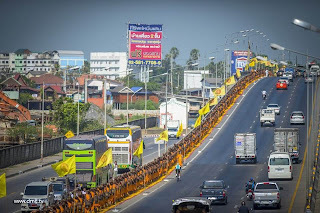 If we are all united in spreading peace through Inner peace, the world will change from darkness to rightness, from impurity to purity, from selfishness to sharing, and be filled with love and genuine smiles. The idea of taking advantage of, or hurting others, anger, and resentment will vanish. 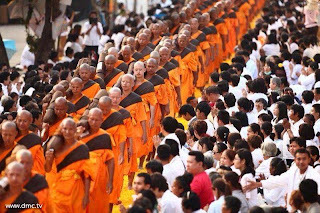 On the other hand, loving kindness, well-wishing, forgiveness, devotion, sharing, purity, and happiness will be everywhere, creating the world peace that everyone has long wished for. Venerable Nicholas has twenty years of meditation experience. He has been giving popular meditation courses in Europe since 1997 and has several TV guest spots, audio CD's, books and book translations to his name. We are honored and excited to have him conduct a retreat for our group, this is sure to be a profound experience for us all! Dhamma Teaching from Venerable Nicholas on the Power of a Still Mind and Cultivating a Pure Mind and the 5 Hindrances. Pilgrimage Walk (1128 monks) explained by Venerable Sander. 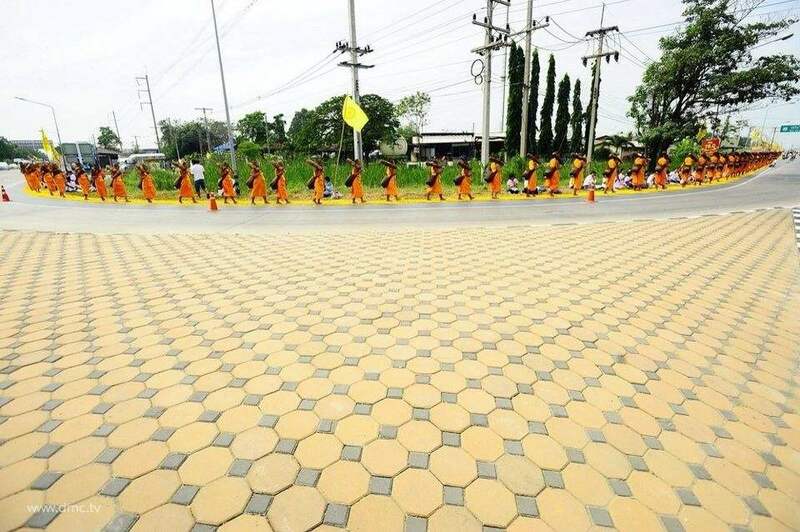 Many lay people all over Thailand have come together to rejoice in the merits and support 1,128 monks participating in this year’s Dhammachai Dhutanga, ( January 2-Janary 27th) this is a pilgrimage walk and designed for monks who have dedicated to train themselves by voluntarily taking on ascetic practices in order to cultivate renunciation and contentment, and to create good energy, for all those around. The dhutanga austerities are meant to deepen the practice of meditation and assist in living the Holy Life. 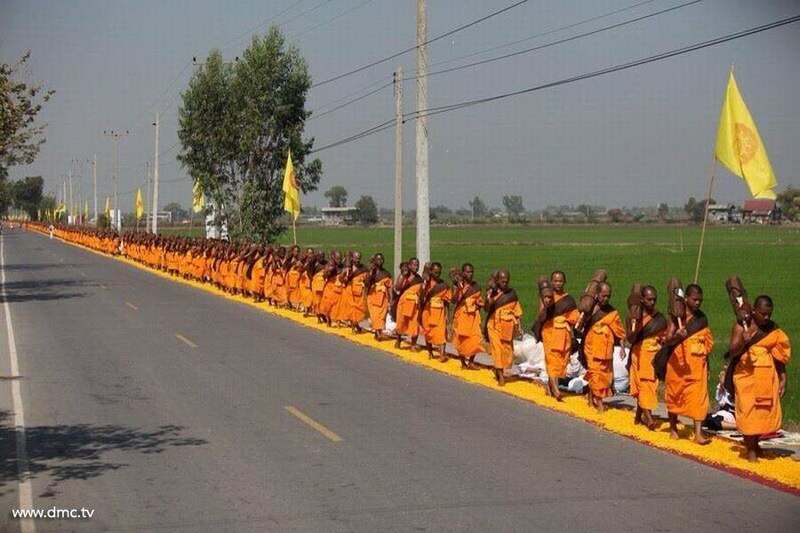 The aim is to help the practitioner to develop detachment with material things including the body. The monks will travel through different provinces in Thailand and end their pilgrimage on January 27th. 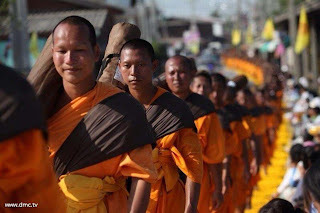 This pilgrimage walk is an inspiration for all laypeople who come together to pay respect and also to rejoice in the merits of the monks practicing dhutanga. It restore's and revive's people's spirit and morale in Buddhist practice across the country. Dhutanga in general helps the practitioner to overcome the attachment to things like clothes, food, the comfort of one's sleeping place, etc. 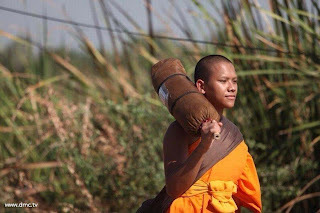 In Thai language, 'Thudong', derived from Pali Dhutanga, colloquially refers to the practice of walking and staying in the open, maybe with a mosquito net, without much property and without any other business to do travelling around to find good meditation teachers and practice for oneself. 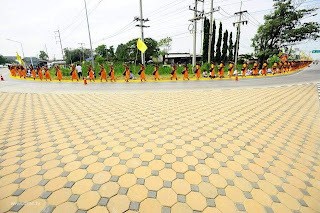 Venerable Dhammajayo, the Abbot of Dhammakaya tries to use the Dhutanga walk as a way to inspire people to learn more about the monk's life, and involve people more in Buddhist practice. 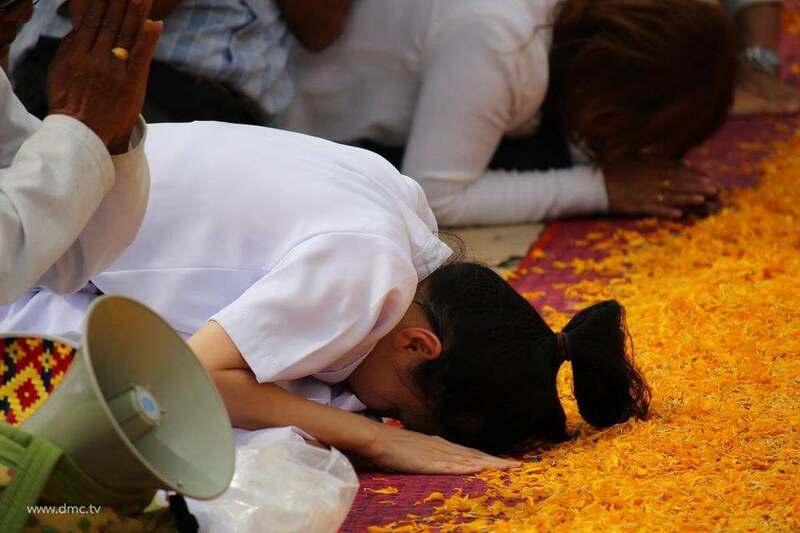 Finally, and most importantly, it is a way to honor Venerable Sodh, our grandfather Abbot who rediscovered the Dhammakaya meditation technique, and to establish the practice of honoring the important places in his life. 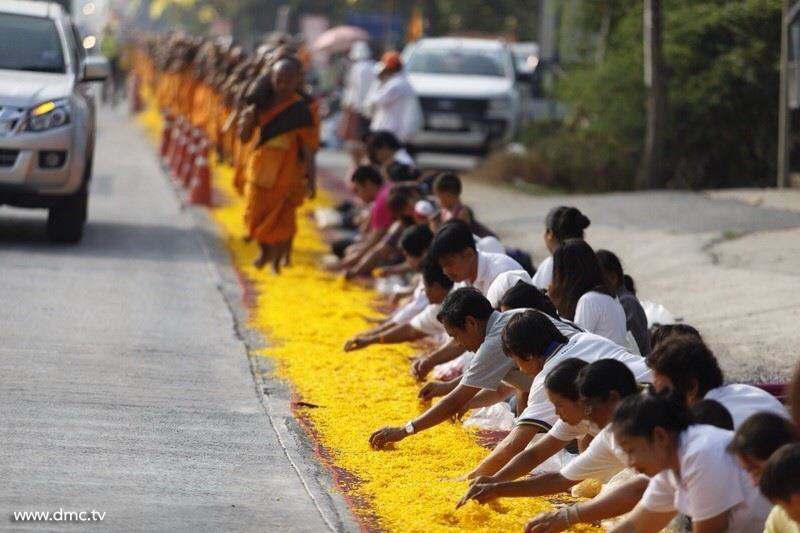 Spreading the flowers is a way for people to learn to honor the Sangha, and honor Buddhism. 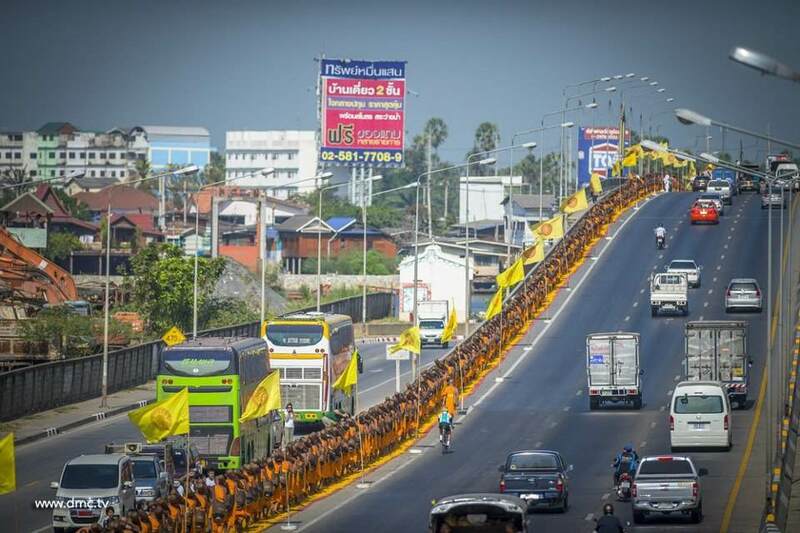 The fact that the pilgrimage is very popular indicates people have a need for showing their support for Buddhism.